With so many diets and theories on eating, it can be hard to know what to send to a client or friend. At Fancifull we have the problem solved. 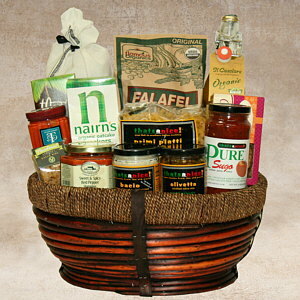 Besides our range of baskets from cheese and wine to artisanal chocolate we’ve been busy adding baskets to fit any diet. 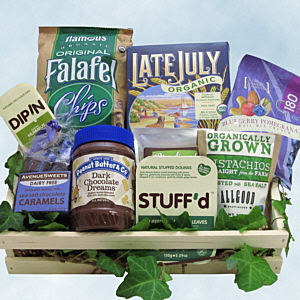 How about a Vegan basket that any vegan or non-vegan would love? Hmmm, what could that have in it? How about some yummy Hummus and Falafel chips? Delicious vegan cookies, (Uncle Eddie’s Peanut Butter cookie is everyone’s favorite – and none of us are vegans), organic tea, Chocolate Peanut Butter, olive tapinade, Laura Ann’s Jams, soups and more are things we have right here in our store. And not just because they’re Vegan. No – they have to taste great so they can go in any basket. Of course organic fruits and nuts always work, and we have a great selection. Non-food gifts also abound: the beautiful Vegan Cookbook we carry, candles, bath items, books, games and more. Call us about the Vegans on your list. For us, it’s no problem.